“How The Other Half Loves” by Alan Ayckbourn is the next play scheduled at CEU the week of November 2-7. “How the Other Half Loves” is a story with many twists and turns, a rich love triangle, confusion and chock full of hilarious encounters. It’s a play sure to keep you attentive and on your toes. Alan Ayckbourne is the master of laughs and a magician in his own rights. At one point he had five plays running at once on the London stage proving that life often does imitate art, because Ayckbourn is a specialist in “simultaneity.” He’s a master at playing with “space” so that one scene can show parallel action in two, or even three different houses; or three plays can show what’s taking place at exactly the same time in different rooms. “How The Other Half Loves” grabs hold of the institution of marriage and gives it a good shake. One little white lie to help cover an affair gets the ball rolling. Fiona, played by Jordan Elkins, tells her easily deluded husband Frank, played by Bo Brady, that she’s been out late at night on a mission of mercy to console the distraught wife of one of his philandering employees. It is really she, of course, who is cheating with yet another of her husband’s workers, a dangerous course under any circumstance, but doubly so in Ayckbourn’s mischievous hands because he contrives to bring them all together for dinner. You can imagine the mayhem: the maligned couple without a clue, the misinformed spouses playing catch-up and the guilty parties working overtime to cover up. The singular living room/dining room set adds immeasurably to the frantic intensity, with actors just missing each other by millimeters as they intersect each other’s trajectories. The set is populated by two couples, each of which is unaware of the other. But the audience is able to observe both households at exactly the same time because, counter to the laws of physics but not the laws of drama, they both occupy the same space. In the hilarious dinner party scenes, even the guests are shared. Above all, it is important that the audience believe these silly people and their hopeless spiral into chaos. One false move and the spell is broken. The play is bound to be a challenge for the actors and audience alike. 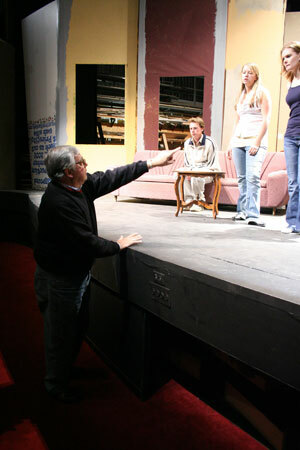 Directing is Ron Frederickson, an acting, voice and diction and text analysis professor from the University of Utah. Frederickson is sure to help the actors become their best in this show. He has directed over 70 plays and musicals, and has quite the wrap sheet when it comes to acting himself. The cast is a strong one. Led by Elkins as the naughty, haughty Fiona who starts the tinder smoldering. Brady is sure to deliver a wonderful performance as Fiona’s deliciously dense husband. When dawn finally breaks, it’s only after a long and arduous battle with the facts. Chandler Durrant is Fiona’s wry, macho lover with Kylee Bird as his exasperated spouse. Part of the fun is watching the neglected wives come into their own. Michael Mutchler as William and Erica Halverson as Mary are a treat as the innocent bystanders sucked into the comic vortex. All complimentary nerves and twitches, the two struggle helplessly to extricate themselves, but Ayckbourne’s flypaper is pretty sticky stuff.